The Thorlabs Dual Channel PM300 Series Optical Power Meter and PM300E Series Power and Energy Meter offer many feaures not found in handheld devices. They are ideal for precise optical measurements, laser and photodiode characterization, lifecycle measurements and many more applications in the lab and on the manufacturing floor. 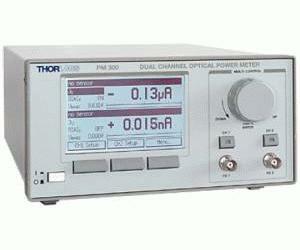 The dual channel design enables differential and ratiometric measurements. Intuitive manual operation with the large graphics display, compatibility to conventional photodiodes, and excellent remote capabilities enable easy system integration. The PM300 is compatible with all Thorlabs S100 Series Photodiode Sensors (two channels) and S200 Series Thermal Sensors (one channel) and allows the connection of unamplified anode or cathode grounded photodiodes with up to 10mA photocurrent and thermal elements with up to 100mV output voltage. The PM300E additionally offers energy measurements with all Thorlabs ES100 and ES200 Series Energy Sensors (both channels) and dual-channel measurements with the S200 Series Thermal Sensors as well. Both the PM300 and PM300E Series are sold as a single benchtop device with the sensors ordered separately. It can be combined with any of our power meter sensor heads, or user-supplied photodiodes that provide a maximum 10mA output. The PM300E Series is additionally compatible with all ES100 and ES200 Series Pyroelectric Energy Sensors.